Lyer Brewery. Beer was probably never brewed in Modrava. This dire plight in the already harsh living conditions was finally rectified in 2013 by the local hotelier Radovan Lyer. He was lucky in finding a brewer and, in the beautiful heart of the Bohemian Forest, supplemented his accommodations with an attractive hotel with a stylish restaurant and a beautiful microbrewery. Its high-quality lagers immediately ranked it among the best of Czech breweries. We prefer quality over quantity, therefore maintaining a capacity of 1000 hl per year. 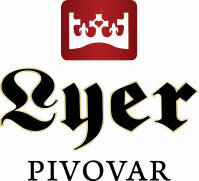 The Lyer brewery mainly brews the king of beers – Pilsner/Czech lager. We brew in a 10-hl copper boiler using the dual mash traditional method from Šumava water and the best Czech malts and Saaz hops. Our beers are bottom fermented and unfiltered. In the summer, we draft a refreshing 10°, in the winter we brew stronger beers brewed from special malts and hops. Lyer 10° light draft, Lyer 11° light lager, Lyer 11° dark lager, Lyer light lager 12°, Lyer Special. Beer can be purchased in kegs at the brewery by special order request. The vast majority of our beer is drunk right in our restaurant, but you can taste it at Food Festivals in Prague, sporadically also in selected clubs in small breweries. For operational reasons, tours are only by prior arrangement and are subject to current technical conditions.